We’d love your help. Let us know what’s wrong with this preview of A Rift in Time by Michael R. Phillips. To ask other readers questions about A Rift in Time, please sign up. This is a bang-up blast that gives Left Behind a run for its money. Full of action, suspense, admirable heroes, despicable villains, and Biblical allusions, A Rift in Time is a wonderful novel. I didn't agree with the theology behind the story, but it was a crackling good adventure yarn nonetheless. Without question, one of the best books I have ever read!!!!! Thrilling storyline, unexpected twists & turns, and an earnest search for truth, make this book a must read!!! Tremendous amount of detail capturing theory and thought on the location of the Garden of Eden. Amazing information on vegetation and the zest of life that throbs deep in aa plant, in the roots, and even dormant seeds. Catured in a complex plot with multiple characters -- requires apt attention to stay with some of the detail. I have reread the book several times and always find it amazing and engaging. Adam Livingstone, world renowned archeologist, takes on the adventure of discovering Noah's Ark and the Garden of Eden. It's a race against other fame seekers, as well as those who don't want Biblical truths revealed. Mystery, intrigue, science, spirituality, light and darkness. It's all in this story. I enjoyed it very much. I read this book quite awhile ago. I was intrigued by the title, and I wasn't disappointed. The best thing about this book for me was simply the plot. The continual unraveling of the author's speculation on the origins of man were so fascinating that it kept my interest until the very end. There was a lot of actual history in it. The connection to reality was the anchor that kept me guessing. It's a great mystery, a grand adventure, and has characters with depth. I'm not sure you can ask more fr I read this book quite awhile ago. I was intrigued by the title, and I wasn't disappointed. I'm impressed that Michael Phillips imagined-up this plot line. I would never in a million years (or 6000 years depending on your point of view) been able to dream this up. Good reminder for me to use my own imagination since I primarily default to a 'what you see is what you get' mode of operation. - Solid read, plot kept me engaged (in large part because I remained curious as to what Phillips would unfold next). - Slightly cheesy in parts. - I haven't digested all the theology to offer an opini I'm impressed that Michael Phillips imagined-up this plot line. I would never in a million years (or 6000 years depending on your point of view) been able to dream this up. Good reminder for me to use my own imagination since I primarily default to a 'what you see is what you get' mode of operation. I liked the book very much. It was a little too...how shall I say this? Right-wing fundamentalist Christian political in some places... But, I loved it none the less. It did remind me that there is good and evil in this world and I want to be on the good side. It is a Christian book by a Christian author and includes archeology, mystery, adventure, and love. Awwww. I'm going to read the sequel. 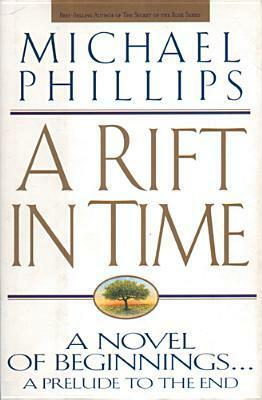 I read A Rift in Time when it first came out in hard cover. It is one of my favorite all time stories, and of course I wish it was real. But is it? Michael Phillips uses sound Scriptural reference, archaeology, history and modern facts to weave a mesmerizing tale. Could they really have discovered where the Garden of Eden and the Tree of Life were/are located? I like to think so. Have read other Michael Phillips, so thought this might be worth the effort. It is a long book, and was a bit tough at times....sometimes the "preachiness" got in the way of the story. But it was a good read, dealing with history, archaeology, Noah's ark, Eden, geology, and God. Thought-provoking thriller on the quest for the original Garden of Eden that may appeal to readers who don't like the novels of Steve Berry or James Rollins as this book also focuses on a religious theme, but viewed primarily from a strictly Biblical point of view. Really enjoyed this book. This was a great biblical archeological book, that weaved history, archeology and the bible all together. There was mystery, suspense and a little romance. A little bit of everything. I love books by Michael R. Phillips. This one was little different because the story took place within the last 20 years. I thought I wouldn't like it but I ended up loving it. Too repetitive in some areas. Too many uses of the word "rejoined/rejoinder" Ok story line. The story takes a long time to unfold, but the author keeps the reader interested the whole time. Pretty interesting theory and a good read, but not terribly challenging. Predictable. One of my all time favorite books and one of the few o have read more than once. Well written story with an interesting take on biblical history in a fictional setting. Fast paced action with an "Indiana Jones" type feel. I enjoyed reading this book. Had a hard time getting into this book. It was difficult to adapt to the author's style, but a fascinating plot and thought provoking biblical interpretation make this a good read. While I enjoyed the plot and premise, I found the novel to be repetitious in spots and often over wordy. Very good and engrossing Christian fiction, though long. Look forward to the next book in this series. This book is thought-provoking and well researched. The characters are engaging as well. It's long, but I enjoyed it. Librarian Note: there is more than one author with this name in the Goodreads database. Michael Phillips has been writing in the Christian marketplace for 30 years. All told, he has written, co-written, and edited some 110 books. Phillips and his wife live in the U.S., and make their second home in Scotland.